We are committed to your satisfaction today and in the future. 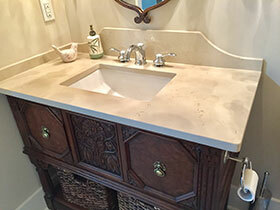 We promise to provide exceptional value, quality, and designs that fit the way you live. 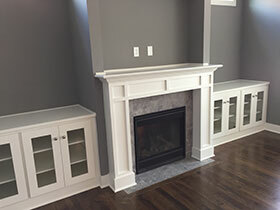 We are so confident in the quality of your new home, we offer you our Platinum, 1-year limited warranty on workmanship and materials. 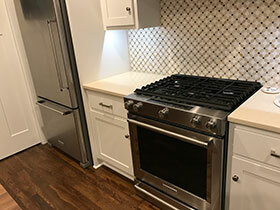 With this uncompromising commitment to quality, Aspen Homes is always here for you. 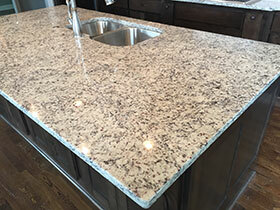 At Aspen Homes, everything we do stems from our passion for quality. 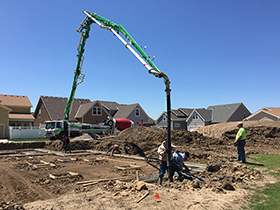 From choosing premium lots to partnering with world-class suppliers, we use only top quality materials to deliver outstanding homes. 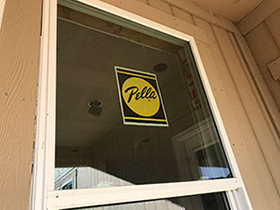 Also, there are over two dozen independent inspections performed on each home to ensure the quality standards through every phase of construction. 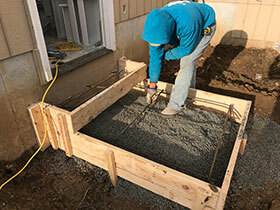 There is a lot to know about the building process, and we keep you informed and involved throughout your home’s construction. 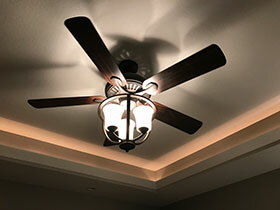 We take pride in sharing our knowledge and experience with you. 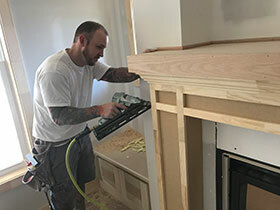 Read on to find out how your Aspen home will be built. As you begin to understand the process, you'll know what you can look forward to during the exciting weeks ahead. 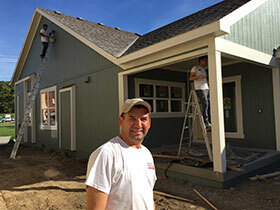 Several pre-construction meetings with the architect, homeowner, and Aspen Homes representatives are needed to discuss any changes and finalize the new home plans. Most municipalities require an engineer to approve any changes to a plan after the architect has made his final recommendations. 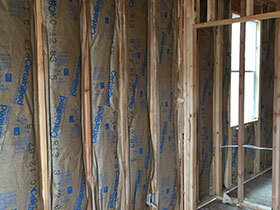 This can add several weeks to the process but will assure that your home will be structurally sound when complete. 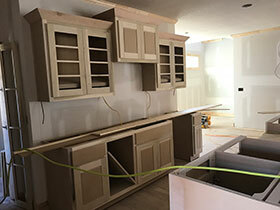 Aspen Homes will then promptly obtain permits, prepare the site, and exercise the proper due diligence to provide the most efficient construction process. Construction usually begins 10 days after you sign the Earnest Money Contract. It is, however, subject to potential holdups such as local government approvals, utility availability, construction backlogs, delay in the developer’s delivery of lots, availability of materials and subcontractors, changes requested by the homebuyer and the degree of difficulty encountered in initiating those changes plus the time for independent inspections. The most frequent cause of delay is usually weather, specifically rain or snow conditions. 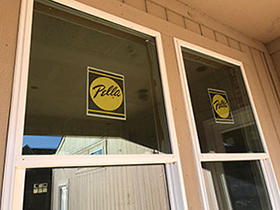 Permits and approvals are secured from the local building authority. 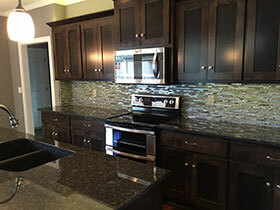 Aspen Homes determines where your home will sit on the home site. 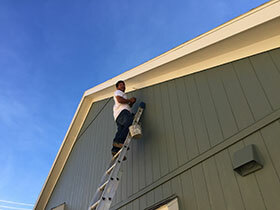 Your home’s position and orientation ("garage right" or "garage left") is determined by such factors as terrain, drainage, utility easements, and municipal requirements for setback and side yards. 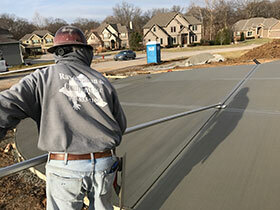 Your home site is surveyed and marked to show final positioning. In most cases the garage is located on the “high side” of the lot. The land is cleared of obstructions, and the soil is prepared for construction. Existing trees may be removed from the home site as necessary, based on placement of the home and sound building practices. Excavation. 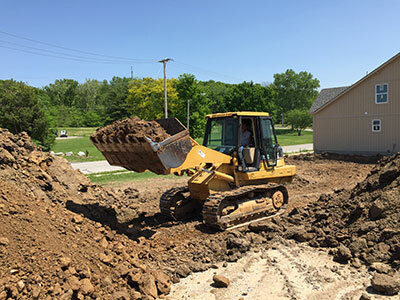 Site excavation is a process in which soil, rock, and other materials are removed from a site, typically with the use of heavy earthmoving equipment such as a 953 Cat bulldozer. Material is piled on site and will be used for backfill at later date. 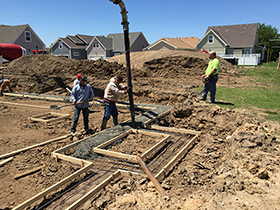 The footing for the foundation is placed at the base of the site. 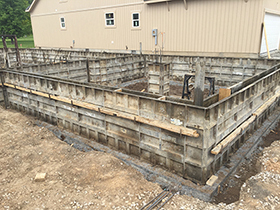 The foundation walls are then placed on the footing. 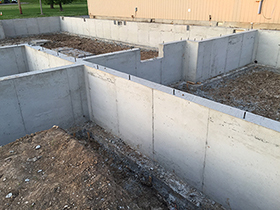 Foundation drain tile and damp-proofing are applied. 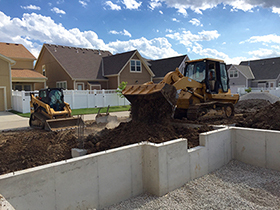 Lot grade is established and foundation backfill occurs. 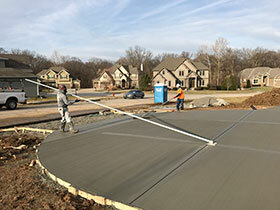 Garage and basement slabs are poured. The foundation stage has several critical inspections. Each inspection must be approved by the local municipality before we can move on to the next stage. 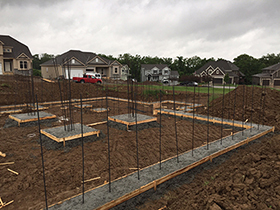 The framing for each floor plan is individually engineered to meet structural and wind requirements. 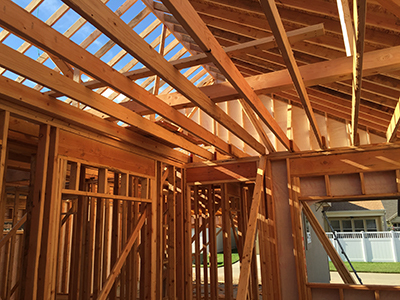 Wood studs, beams, floor joists and/or floor trusses, and rafters are used to create the skeletal structure of the home. The exterior walls, interior walls, and roof are erected. 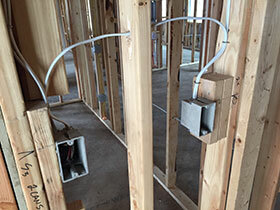 Framing is inspected per local requirements. Exterior sheathing and siding is added. 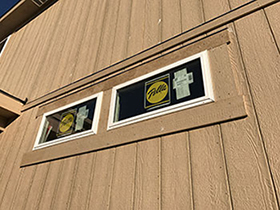 Windows, doors and exterior garage doors are installed. 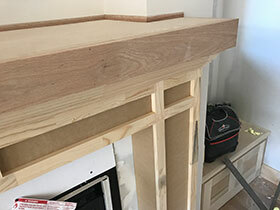 The eaves, fascia, and overhang are built. 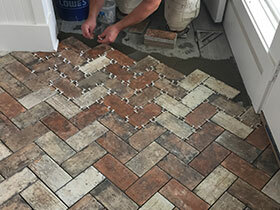 For some homes, brick or stone is installed. 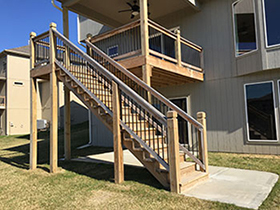 Covered deck and stairs are installed. Roof decking and shingles are put into place. 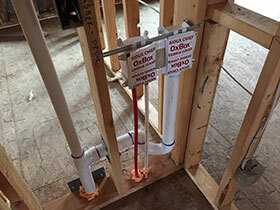 Plumbing waste, vent, and supply lines are installed. 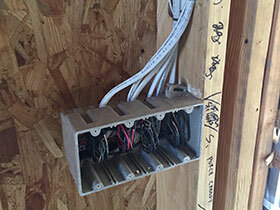 Wiring and cables are installed, including electric, alarm wiring, RG6 cable and CAT 6. 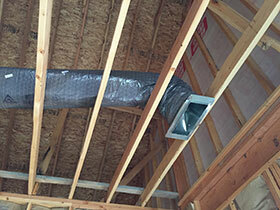 HVAC (heating, ventilating, and air conditioning) equipment and ducts are installed. 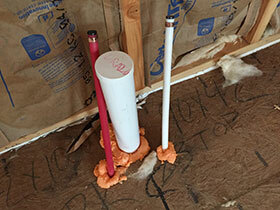 Once the mechanical systems are installed and inspected, insulation is placed in the exterior walls. 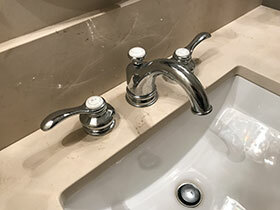 Mechanical systems are inspected per local requirements. 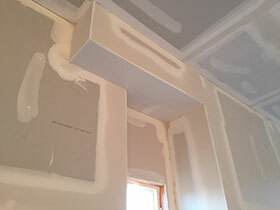 The sheetrock, also called drywall, is installed. 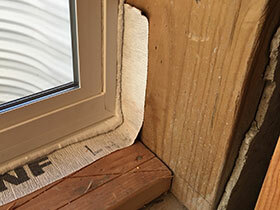 It is then taped and floated to cover fastener holes and seams. 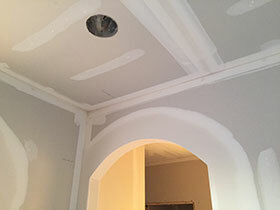 Texture is applied to the ceilings. 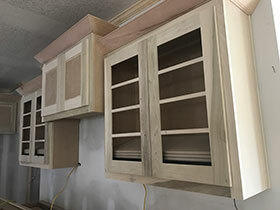 Bath and kitchen custom cabinets are built and installed. 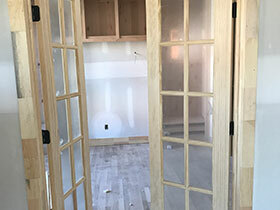 Moldings and baseboards are installed. 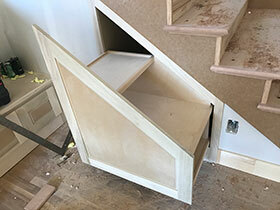 Stairs are installed (if applicable). 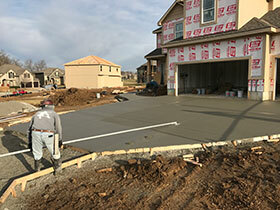 Patios, driveway, walkways and sidewalks are placed. 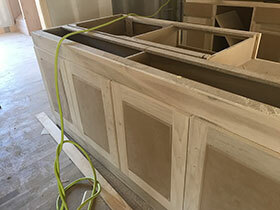 Interior latex painting, caulking, and lacquer base staining begin. 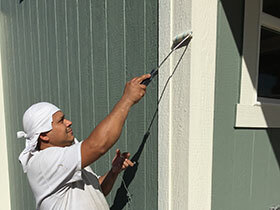 High-grade oil base enamel is applied to all designated trim material. 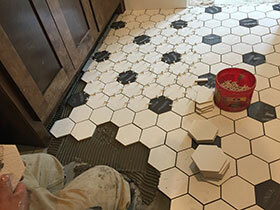 Tile is installed to backsplashes, floors and the fireplace. The HVAC compressor and thermostat are installed. The HVAC components are matched for maximum efficiency. The alarm keypads and control panel are mounted (if applicable). 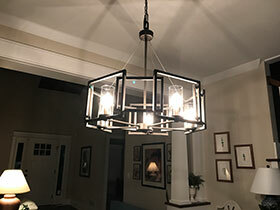 All grilles, switch plates, receptacles, and light fixtures are installed. All final paint and stain is touched up. 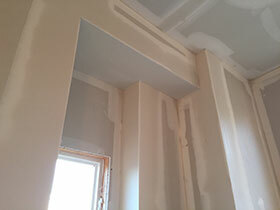 Any remaining floor moldings are installed and painted. 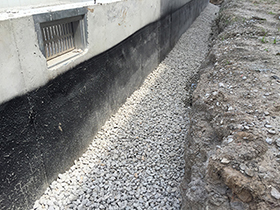 Final grade of the site is completed. Irrigation is added (if applicable). Landscape and sod are installed. Your home is again inspected by the local building inspectors. 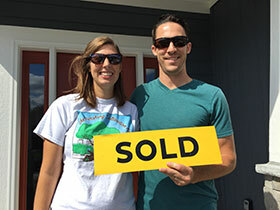 Your Aspen Home is now ready for closing and move-in.